At last there is some snow on the mountains although I can’t see it right now as the cloud is so low. All the skiers were getting a little worried as the slopes were supposed to open a couple of weeks ago and really the weather has been very warm. Today is the first really rainy cold day we have had for a while. Apparently the weather in London is to be cold and wet too, so have to pack warm weather clothes, of course my bag is all packed and ready for tomorrow….not! Well there is one project I have to take as I have finished the pinafore part of the pressie but the cardi is still some balls of wool unfortunately! 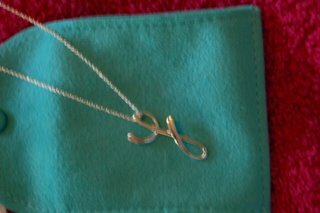 Yesterday I got a lovely surprise in the post, my birthday present from my brother and sister-in-law and it came in this box and I love it, the guys in this house need to take note…….. So I am off till Tuesday, see ya…. 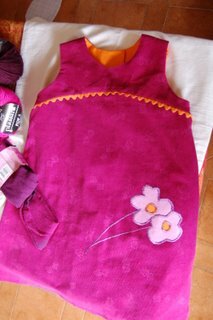 Oh the pinafore is beautiful, what a lovely gift, such lovely colours and I am sure the cardigan will be perfect. Have a wonderful trip and birthday. 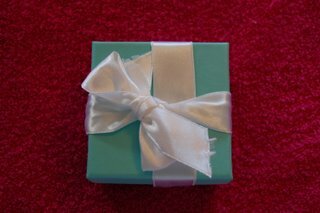 Is that a Tiffany’s box I see? Happy birthday! What lovely presents all round. ahh that is my favourite box! Now that’s the sort of box we all like to see on our birthday! Have fun in London. Have a wonderful time in LOndon – and a very happy birthday to you. Thanks for all your birthday wishes, it was a couple of months ago but I just received my pressie which I love, and unlike Mary I was 40!